In most relationships, there's the partner who is picky about home improvements - and then there's the one who's picked on. Save the marriage counseling appointments for the really dicey topics and hire a pro to help you navigate through the ups and downs of homeownership. What Needs Done: You know how they say that eyes are the windows to the soul? Well, windows are the eyes of the house, and yours are blood shot, puffy and could really use some Botox around the corners. The Solution: They need to be cleaned - and there are two ways to do it. You could figure out the soap situation, find a ladder, manage a squeegee and get in a fight with your spouse about the streaks you left behind, all while knowing that one wrong move could send you plummeting to your death. Or you could spend less than one fifth of what you sink into your Starbucks habit (According to a 2012 study, working Americans drop an average of $1,092 a year on the caffeinated stuff.) and have the pros do it for you. While they're there, have 'em paint your front door and outer shutters. This instant lift costs less than a grand, on average, and will get you out of painting the whole house for at least a few more years. Win! 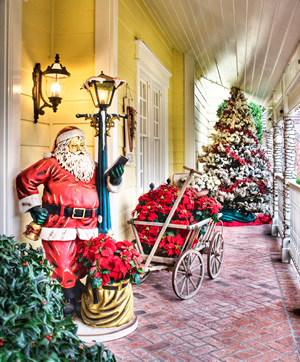 What Needs to be Done: The halls need to be decked, which is what you better hit if you don't get your holiday light display up right after Thanksgiving. The Solution: Don't even bother trying to do this one yourself. In the age of social media, we've become convinced that anything less than our home's lighting display "dancing" to an accompanying live orchestra playing Beethoven's "Ninth Symphony" is... underwhelming. Let a pro utilize their wholesale distribution network to score you better-quality lights than you could ever find on your own, then give them an idea of what the "Christmas spirit" looks like for you during your free consultation. You'll be able to take pride in your display without ever having to wield a staple gun while standing on a slanted roof 15 feet above cold, hard concrete. They'll even take them down for you and pack them away in convenient storage containers. What Needs to be Done: According to them, "everything." But, specifically, your better half is clamoring for "color" in the front yard, perhaps forgetting that mandatory water conservation is in effect. The Solution: Planting mature drought-friendly blooms and quick-growing grasses can certainly put a "pop" in an otherwise dreary winterscape just in time for the arrival of holiday guests. But there are other ways to brighten their day - literally. Landscape uplighting on architectural features, trees and taller bushes adds beauty and dimension after dark, when most of your entertaining will happen anyway. Bold pathway lights with an iron finish are another attractive way to please your partner who has a penchant for the dramatic.